TAKING advantage of lower labour costs, favourable demographics and a growing consumer base, South-East Asia is next up in the flying geese formation of Asian economies. But significant investment will be needed for the region to achieve its potential and diversifying sources of foreign capital will be a key objective. It has been nearly a decade since the Global Financial Crisis (GFC), and yet the world economy does not appear to have fully shaken off the lethargy that followed it. Despite the advanced countries showing some signs of improvement, US GDP growth has yet to break through the 2.5% range, and the eurozone is only now beginning to show signs of life. Meanwhile, debt accumulation in China has necessitated a growth moderation there that further dampens global demand growth. Besides a spurt in 2010-2011, real growth of global trade in goods and services has fallen to an average of 3.3% since 2012, compared to 8.4% in the five years preceding the GFC. The South-East Asian economies have not been insulated from the impacts of these developments. 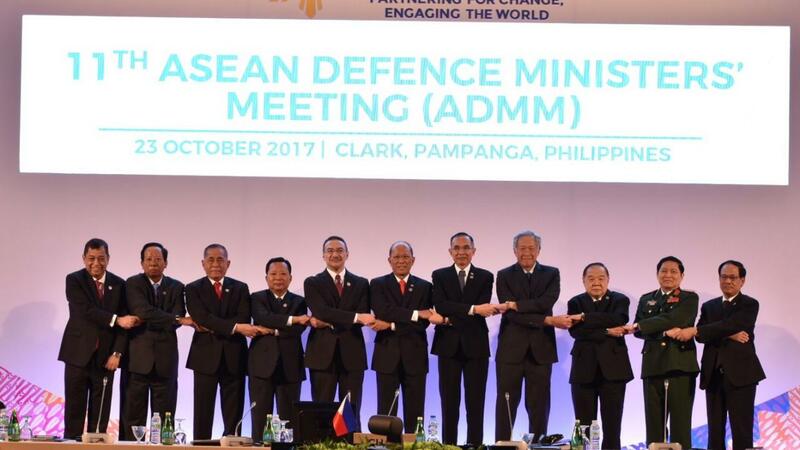 Asean defence ministers are meeting today to map out a response to possible new threats posed by ISIS as some of its fighters return to Asia to regroup and recruit after its defeat in the Middle East. Their two-day meeting at a former US air base north of Manila comes as Philippine security forces remained locked in fierce combat with some 30 remaining Muslim militants and their kin in Marawi city. The latter are holed up in a two-storey structure in the southern Philippine city, which has been wracked by fierce fighting for five months now. Transport is key to regional integration in the borderless world of globalisation. Asean's aspiration of transforming itself into an economic community depends critically, therefore, on its ability to transcend the physical borders running through it. It has taken a noteworthy step in that direction by moving towards forming a single shipping and aviation market, while making it easier for buses to move across borders. The immediate effects will be economic since ease of travel encourages greater interaction. Shipping, aviation and road transport act as powerful multipliers for domestic economies, plugging them into a whole that is greater than the sum of its parts.